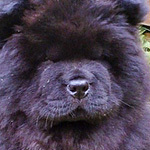 Health topics and issues with Chow Chows. My Bear Bear has had a UTI, urine infection and was on antibiotics for 10 days. When we finished them we were also changing her old food, which was a healthy brand to the new vet food, because he said it can prevent her from getting a kidney stone. It's been 2 weeks we are slowly changing her food and she threw up 3 days ago once in the morning and then in the afternoon. It was liquid and small, color yellow. I then went back to the vets yeaterday, to leave her urine sample to get an update and told them about he being sick. I told the vet that I think she might be allergic to it, because she is itching again, like she would a year ago from this old food we used to give her and that she threw up twice. He said the food they prescribe is very healthy and doesn't think she is, but understands all dogs are different. He wanted to get her on meds again! for allergies to see if she does have any for another 10 days! Money is very tight and I told him I will shower her in a day and see if it could be the snow. Well she threw up again last night like an hour or two after eating the new food mixed with the old and this time it was solid, like not liquid. I called them today and the lady on the phone didn't sound concerned, said if I could take her in today, but can't. I will try tomorrow and I had to ask if I can give her, her old food for now. They didn't even give me alternatives, like white rice or anything to settle her stomach. What do you think? I read reviews on the food and so far they were good, until I found the bad ones and the symptoms relate to my dogs. One commetor got my attention when he said "Beware of this pet food. If your pet shows any sign of abnormal behavior, stop using it and research a different pet food. Keep in mind that the vet will more that likely tell you it's not the food...But keep in mind by selling you this dog food the vet is in hills food company's back pocket. So, if you don't buy from them, they do not make the huge profits." The food brand name is Hills prescribed diet dog food c/d for the bladder. Could it be the medication making your dog sick? Anything is possible so it could be the food. I would suggest that you don't give Bear tap water anymore. Using filtered water decreases problems with infections. Been there and done that. LOL!! Hope you find out the problem and Bear is feeling better soon. Does bear actually have kidney stones? If not why is the vet suggesting a food that prevents them. Better to get your chow onto a good food that they are happy and healthy on and there will be no need to worry about kidney stones. Kidney stones are generally caused either by Uric acid or calcium build up. Find out why your vet thinks you Bear is at risk and then try to find a food that is lower in protein (prevent uric acid build up) and ask them if they think it is suitable. You didn't say if this UTI was a recurring problem. Mine have all had the odd UTI and I never had to change the diet for it. As someone mentioned vets only gets any kind of dietary training from the dog food companies so it stands to reason they will always jump to the solution of the company who trains them....thats why the companies bother! Educate yourself on what constitutes a good dog food. Straight off I would say no corn, no wheat, no yeast (can cause yeast infections). Try to find a single protein....I prefer fish as it causes less allergies than chicken and beef and if you need to keep the protein lower then I would use a food that has brown rice as a filler or use a grain free food and put extra cooked veg in to lower the protein a bit. Root veg and green beans etc are good. Avoid onions, garlic and grapes as they are all toxic to dogs. If it was me I would go back to my vet first and foremost and try to find out their reasoning. Stress is the most likely cause of a UTI IMO. The comment about otitis is interesting. My foster dog frequently shakes his head, but I haven't noticed any issues with his ears. I will dig deeper. Chows are sensitive to diet. I feed a lamb and rice formula because it is what seems to go well with Ursa. I went through several types of food before settling on this one. We currently have a cat with UTI problems and feed him a special diet. I know from experience about felines and urinary track issues, but have not had dogs with any issues. Don't be afraid to question your vet. I have done well with the vets which I have had. 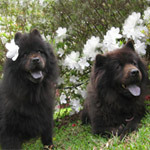 They have been opened to working with chows and are knowledgeable about chows. I cannot say that about all vets.